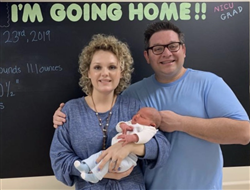 Hendersonville, TN (January 23, 2019) – Avenue is excited to announce that Autry Clark Kemp has been released to go home. The world of Southern Gospel grew when Autry was born Friday, January 18, 2019. Proud parents are Kasey Kemp of Avenue and Haley Kemp. Big sister, Avaline, is excited to have her baby brother home. Autry has been in the neonatal intensive care unit at a Nashville area hospital since he was born last week. Autry was delivered at 37 weeks to avoid diabetes related complications. Haley Kemp, a Type 2 diabetic, is recovering well following the Caesarian section delivery. “We know God has had his hands on our son. Every day Autry has grown stronger, we are thrilled,” stated Kasey Kemp. “Your friendship and love encourage us more than you will ever know,” Kemp continued regarding the response the family has received. The Southern Gospel group is comprised of Kasey Kemp, who sings baritone. The lead part is sung by Jacob Lagesse, while the tenor part is carried by Corey Lackey. Avenue expects to continue their ministry dates as scheduled.